Welcome to Tres Rios Service Academy, home of the Pumas! We are a K–8 school in the Littleton Elementary School District #65. Located in Tolleson, Arizona, approximately 18 miles west of downtown Phoenix, we enjoy a friendly, family-oriented, small town atmosphere. At Tres Rios we believe in the development of learning communities and that every child can and will learn if provided an appropriate environment. We are committed to providing the tools to help our students be healthy, successful, lifelong learners. We offer a variety of programs to meet the needs and interests of our students, including an athletics program, special education, a band program, and a gifted program as well as state-of-the-art technology. We recognize the value and importance of parent/guardian participation in a child’s education and welcome your involvement. We have provided several ways to help you stay connected, including a Facebook page, Twitter, and this website. We thank you for your interest in our school and for supporting your child(ren), as we work together to educate and prepare our most precious assets—our children—to take on the world! It’s that time of year again when Pumas have an opportunity to show what they know. During the month of April, our students will be taking the AzMERIT assessment. We ask that during this time you ensure your students are at school everyday, they get a good night’s sleep each night, and that you are mindful of when you are scheduling appointments. Once a student starts a test, they must finish it before leaving for the day. We also ask that, if possible, students bring headphones to school with them, as they will need them for the test. Thank you for your continued partnership! Please feel free to call me or any of our administrators if you have any questions or concerns at (623) 478.6300. 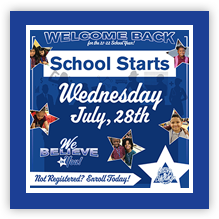 We are looking forward to a great school year! As always, please visit our News page for our up-to-date newsletters. There is no school on Friday, April 19 and on Monday, April 22 for spring recess. The parking lot in front of the school is a dangerous place to drop off your child in the morning, especially if you stop the flow of traffic.